Floaty and flouncy, the Carmen skirt is perfect for the hot weather! The Carmen Flounce skirt is a gorgeous feminine shape offering the look of a wrap skirt while still retaining some modesty in a mock wrap style version. The Carmen comes in two lengths – one short and sassy while the longer length evokes the same flirty feel but ideal for the colder months or for those of us who like to cover up our knees. The Carmen comes with a standard waistband, high torso waistband and can be made in a stretch fabric. Fiona is the latest dress pattern from Closet Case Patterns and can be worn all year round! The lovely Fiona dress sewing pattern from Closet Case Patterns is a fitted button-up sundress which features shoulder straps, princess seams, a straight cut skirt and fetching topstitched details. Wear it on its own during warm weather months, or layer it over tees and turtlenecks as the weather cools. View A features a bra-friendly bodice and midi length skirt with side slits. View B features crossed straps and a low back, with a mini or below knee length skirt. All skirts and bodices are completely interchangeable so you can mix and match the Fiona of your dreams. This pattern is named after Fiona Parker from the blog A Diary of a Chainstitcher who inspired the indie pattern company with her modern, feminine style and generous contributions to the sewing community with her sewing and pattern round-ups. Whether you wear it alone or as a base layer, the Crystal Cove Cami is an indispensable garment in your wardrobe. It's been designed for woven fabric, and comes in different cup sizes (A, B, C. D and DD) The relaxed fit bodice has an overlapping back with curved hem, spaghetti straps providing a one-of-a-kind look and it's comfortable to wear too. It's suitable for beginners and comes in sizes 0-20. Just received our copy of Simplicity’s summer catalogue, it’s full of new patterns with the latest fashion and styles to sew! The latest summer styles begin with silky wrap dresses, extra detailing, assymetrical styling and gorgeous fabrics. Just click on the images to buy or read more about the patterns! Effortless chic ruffle dress (and top) from one of our favourite designers, Cynthia Rowley – this oversized design features a ruffle tier and shirred neckline. Easy to sew off-the-shoulder ruffle or one shoulder dress is available in two lengths. Make with flared skirted dress with flounce variations or one sleeve or shoulder strap with high-low skirt. Elaine Heigl has designed this dress for plus sizes too. It's lovely and loose and features a handkerchief design with length variations. Available in sizes 10-18 and 20W-28W. Looking for a beach cover up, kimono or dress, this multi-tasking duster is great for any occasion. It feature length and sleeve variations, and is ideal for lace, sheer and or silky type fabrics. Indie pattern company, Sew House Seven has been designing for Simplicity. This Jumper dress features bib jumper with braces and back drawstring to achieve a perfect fit. Figure flattering knit dress from Mimi G, which features peek-a-boo front slit with elastic ruching and invisible centre back zipper. From vacation to casual day, this is score the perfect wrap dress and features romantic ruffle options and sleeve variations to create a dress that’s perfect for you. Just starting to sew? Then these edgy simple to sew patterns are ideal for you with pretty tirm options. Just click on the images to buy or read more about the patterns! Learn to sew with these trendy knit tops for miss. With this pattern, you’ll learn to: sew elastic casings, apply bias tape to finish an armhole, sew a double stitched hem and use grommet trim as a shoulder strap. These paper bag waist shorts have drawstring variations. In this pattern pack, you’ll learn to make a tassel, sew a buttonhole, make an elastic casing with heading, sew a side seam pocket and topstitch a hem. These pull-on skirts come in length variations and a belt bag. Learn how to sew an applied elastic casing, cut a scalloped edge fabric, work with non-ravelling fabrics, use webbing and D-ring to make a belt and work with novelty sheer fabrics. This Cut & Sew super easy knit skirt and top has only main pattern piece for both top and skirt, and is great for beginners. The skirt features asymmetrical design and the top is loose-fitting with dolman sleeves. Can be worn together or as individual pieces. Simplicity's pattern hack collection has been designed to put the creativity in your hands. Starting from basic shapes uses the patterns and instructions to create unique pieces and build your perfect wardrobe. Just click on the images to buy or read more about the patterns! This caftan includes options to create a kimono, top and dress that you can customise to make your own. 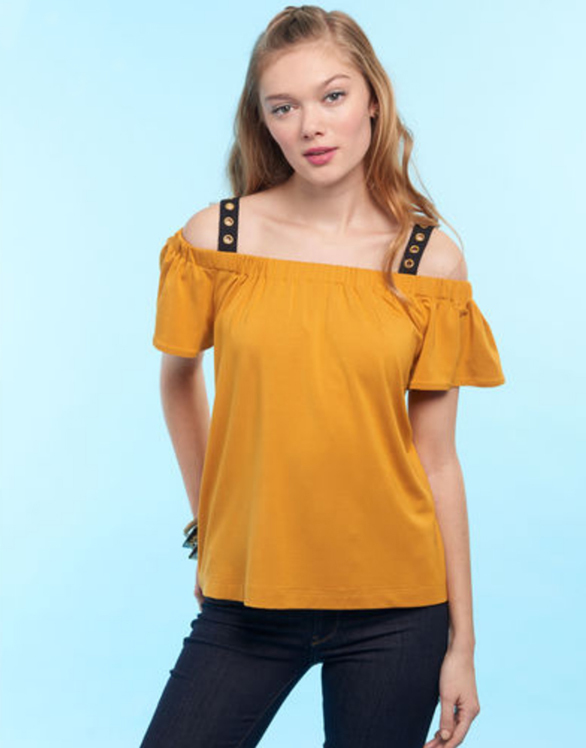 This raglan sleeve top includes options to add flounce or ruffles to your top or add back interest so you can make in a way that defines your style. It's all about the style this summer with beautifual assymmetrical designs, extra detailing and volume! Just click on the images to buy or read more about the patterns! Pack of simple tops to sew with beautiful sleeve detail and featuring a shell top and bust darts. Create the ultimate wrap top with this fun and festive tops pattern. Includes length and sleeve variations and features flatter V-neck collar. This pattern includes knit tops featuring asymmetrical hem with optional cold-shoulder, contrast sleeve, 3/4 sleeve or sleeveless view. 1940s style short-sleeved top and shorts set features a top, which ties in a knot in front leaving a bit of a bare midriff, and shorts that are smartly pleated in front and back and finished with a waistband. A shaped yoke, gathered at the sides, releases the soft fullness of the skirt ,which is also included. Great pack of patterns for easy to sew tops with sleeve interest such as one shoulder look, flounce or ruffle sleeves. Adaptable separates to go with those designer tops. Just click on the images to buy or read more about the patterns! This Gertrude Made vintage-inspired pencil skirt by Cathi Bessel Browne is great made in prints or solids suitable in bouclé, chino, chintz, damask, denim and gaberdine. Get your complete summer wardrobe in one pattern with this sportswear pattern including plus sizes. Trousers are pull-on design with wide leg or swing short view, and top has optional tie front with button-front placket. Available in sizes 10-18 and 20W-28W. Mimi G’s high waisted trouser pattern comes with optional slim or bell bottom plus a summer-ready tie front blouse. Versatile easy to make pattern includes asymmetrical skirt, swing shorts, and trousers with optional side ruffles or front seams. 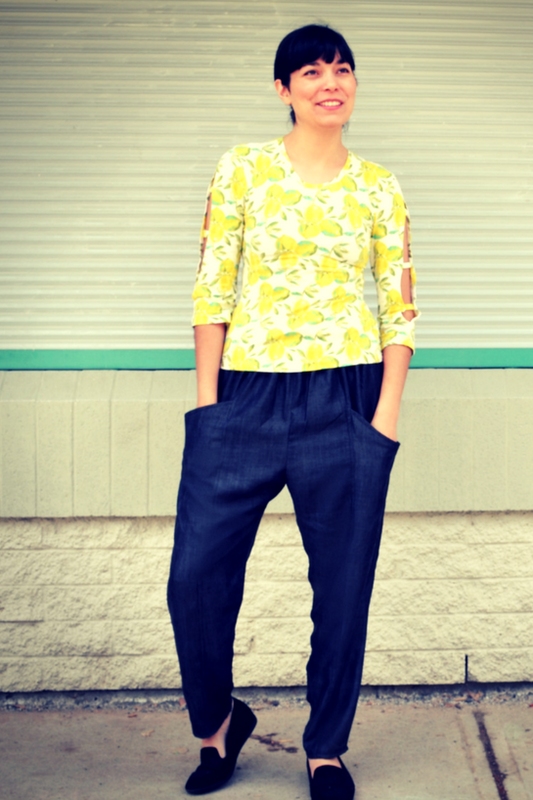 New PDF trouser sewing pattern from DG Pattern that's perfect for this time of the year! 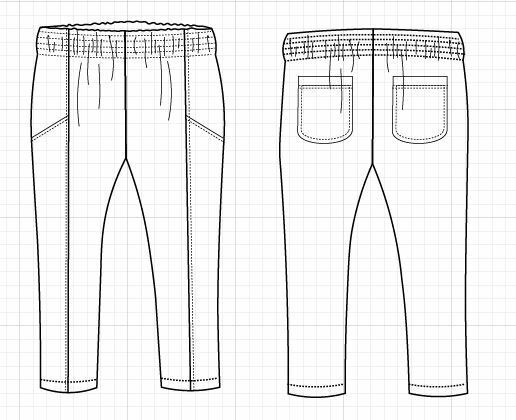 Nathaly is a loose-fit, dropped crotch style trouser pattern with an elastic waistband, and sharp diagonal front pockets. The trousers also featured a tapered leg style and round back pockets. It's a great pattern for light to medium weight woven fabrics such us linen, denim, tencel denim, chambray, and cotton sateen. The pattern has a generous 4in ease at the hip point making them extra comfortable. Simply click on the image to buy and find out more about the sewing patterns. Amy Nicole has just launched the Roksi Trio - a pattern which features a crop, tank and dress pattern that can be worn in 26 different ways! We love it and it's the perfect make to have all holiday all-sewn up! The Roksi Trio is a 26-in-one pattern that includes a crop top, tank, and dress, which are all reversible. The silhouette has an extra swing and is perfect for hot summer days. Each view can be layered over the other for a tiered look, and with the reversible factor, you'll never be able to say you've got nothing to wear as the outfit possibilities are endless. This pattern is best suited for lightweight fabrics with great drape. Although lightweight fabrics with more body would add a lovely shape to the silhouette. The Roksi Trio is the second PDF pattern released by Amy at Amy Nicole Studio. She continues her love for comfortable, playful, and one-of-a-kind silhouettes with this new pattern design. All Amy Nicole Patterns are drafted with petite sewists in mind, including guidelines for taller ladies to easily make adjustments. The patterns are quickly becoming known in the sewing community for their clear and efficient 'assembly line' construction style along side concise and easy-to-follow instructions. The Roksi Trio includes three views, fully reversible, a hack for a non reversible, bias finished version and for an all-in-one, tiered version. The PDF patterns have been layered for printing your size, interactive instructions for easy navigation, assembly line instruction style plus a printable pattern envelope cover sheet and instruction cheat sheet for advanced sewists. Felicia is a pull-on dress, which features a sleeveless bodice with stitched down neck and armhole facings, bust darts and a soft gathered skirt with side pockets. 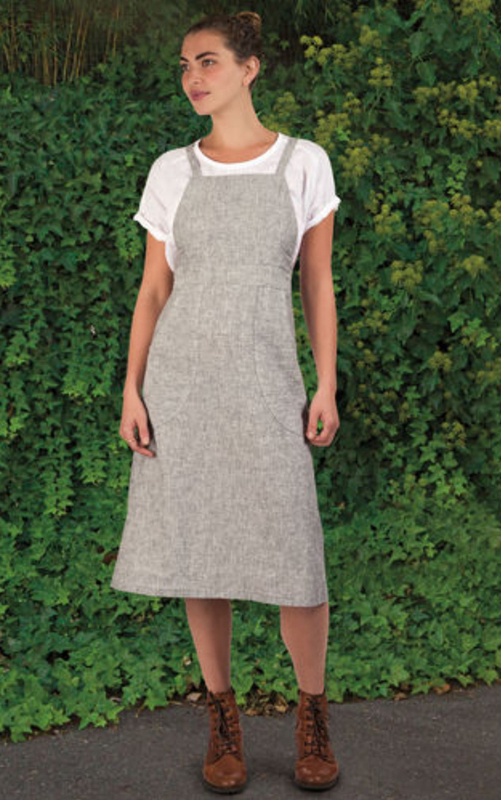 Fabrics recommended include light to medium weight linen, linen blend, cotton, viscose, lightweight wool crepe or wool gauze.The Felicia Pinafore Dress comes in sizes XXS through to XXL and all sizes are included in the pattern. ULYSSES mixes trench coat styling with a relaxed, modern look. The relaxed, straight-cut coat features draped elements such as a shawl collar and a clean-lined, curved back 'rain guard' overlay. Notched-out holes along the sides seam of the overlay allow the coat's belt to exit through from the back to the front. Other beautiful design elements include shoulder epaulettes, clean-lined, angled patch pockets with an upper flap, centre-back vent, and gently angled hemline at the front. The body of the coat is unlined, making it the ideal choice for the warmer months. Instructions are given for finishing seams with binding, which creates a beautiful interior for the garment. The Ulysses Trench is available in PDF format for $17 and print for $19 from Victory Patterns. With its boxy shape, cropped hem and pretty collar, Libby is a contemporary but timeless little shirt with lots of potential. It features a loose fit, button-up front, notched collar, partial collar stand, unlined yoke with gently gathered back, and short grown-on cuffed sleeves. Libby looks perfect for wearing with a high-waisted skirt or jeans, and as it has a cropped hem with two options: you can keep it straight across the front, or gently curve it to add a little extra length. Both versions feature a slightly curved back hem. The shirt makes the perfect canvas for fun prints although it looks just as gorgeous in a solid colour fabric too. The unusual collar stand and notched collar gives sewers the chance to build your sewing skills. It's easier to sew than a traditional collared shirt, manageable, fun-to-make and a stylish introduction to shirtmaking. This classic knit wrap dress from DG patterns looks so comfortable to wear with its gathered skirt and flared opened sleeves that add sophistication to a simple knit dress. It's semi-fitted dress with a wrap style front and features flutter sleeve style with an unusual cut out opening for comfort. The skirt has a simple gather style with a falttering knee-length. There are also several sleeve options – regular long sleeves and long sleeves with bows for the colder months, and then short sleeves and a sleeveless alternative, perfect for spring and summer. The sewing pattern also comes with side panels and straps that make the fitting part much easier. The design is naturally loose but with the straps you can adjust it to get a closer fit. With lots of detailed instructions, technical drawings and tips to get the best results, the pattern will become a staple in your handmade wardrobe. You can also learn how to make the pattern on our YouTube Channel. to make then Gwen is for you! Add a touch of understated elegance to your wardrobe with the Gwen dress from Colette Patterns. The simple, body-skimming fit and elegant styling makes for a timeless garment that can easily be taken from day to night. We love the little ruffle on the strap and the side slit. This sewing pattern is perfect for beginners and can be made into a camisole if you prefer. It's available in US sizes 0-26 and looks stunning in solid coloured fabrics or go bold with a bright floral print. The Reno wrap-style dress features a front V-neck, crossover shape and dolman sleeves, and the pattern offers a short sleeve style with cuffs and a waistband. What makes this just a bit more than another warp dress is the sweet petal hemline to add a one-of-a-kind detail to this dress. The pattern also features three ease points at the bust so you can get the perfect fit for you. Reversible raglan dress or top that can be made in woven or knit fabrics. Pattern features loose fit, optional pockets and waist tie, as well as top and dress options. It can be worn with the V neck or the round neck side at the front. 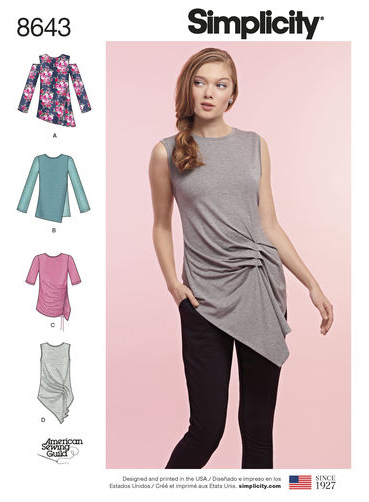 Bella is a gorgeous V-neck wrap style crop top with waist ties that can be styled at the side seam or centre back, and features a sleeveless or angel sleeve option and works great with soft knit fabrics. While Sophia is a trendy flare pant which includes a high or low-rise option. The pattern is beginner-friendly and perfect for stretch spandex/lycra fabrics. Both patterns are from the newly released collection Free Spirit. Buy from Rosy Peña by clicking on the image. This pretty vintage inspired figure-flattering fit-and-flare dress has pintucks on the front and pleated sleeves with a slightly higher waist to give the impression of a smaller waist and longer legs. It's not only about how it looks, it's practical too with the all-important in-seam pockets, options for A, B, C, D and DD bust cups, easy-fitting back bodice princess seams, jewel neckline with a centre front slit and button closure, invisible back zipper and short and 3/4 length pleated cuffed sleeves. This is an easy-to-sew dress that has a relaxed, elegant style. It includes bust darts for shaping and optional on-seam pockets. With no buttons or zipper, and with instructions for a full-bust adjustment, this pattern lets beginners sew a perfect looking and fitting dress. The Amalfi dress is perfect for any occasion, it's easy-to-sew, easy-to-wear. The dress sits just above-the-knee or make as a feminine tea length skirt, both of which can be made with the optional in-seam pockets. Sleeve styles include a gorgeous flutter sleeve and gathered short sleeve. Both views have a flattering V-neck line and bust darts provide shaping and ease for a great fit. attern instructions include a section with tutorials to increase the dart uptake with a full bust adjustment and to add or subtract length from the bodice and skirt. This is a pull-on blouse or dress that's perfect to wear any day and anywhere. With a relaxed fit and a flattering V-neck, the pattern features kimono sleeves (meaning no sleeves to set-in) and no closures, making it super easy to sew. The front facing provides an opportunity to use a fun contrasting or complimentary fabric. Extra-Sharp Pencil Skirt is a classic, unlined pencil skirt that includes side panels, back yoke detail, and back walking vent. Because it has no seams, the front panel allows use of almost any patterned fabric including bold prints loved by quilters who also make clothes. The Bonnaroo Tank is a loose, basic style, which has a flattering silhouette and the Bonnaroo Skirt set includes a hi-lo version with or without ruffles, a gored version and two interchangeable waistband options. Choose a simple yoga band or a corset-style waistband. These PDF patterns come in sizes for tween sizes 12 an 14, and women's sizes 0-26. Dajana is a beautiful, fitted princess seams dress with sleeveless, which sits just below the knee and has a crew neckline. There's also an optional short sleeve option and 1in ease at bust point. We've followed Nikki Brooks-Revis, a McCall pattern designer and Mood Fabrics blogger for a long time and she always looks amazing! This PDF coat pattern in sizes sm-xl and has beautiful pleated oversized sleeves, high waist belt, and side seam pockets. The coat is fully lined and perfect for a beginner to tackle. The Phoenix is a casual but cute boho style top perfect for year-round wear. It features ! statement 3/4 bell sleeves or make a sleeveless option with bias tape. Both views have that signature boho style yoke and gathering on the front and back. Optional ties can be inserted into the front opening for a great detail. This cute skirt pattern features a large waistband and gathers and you can make it with a zipper or a button at the back. It's knee-length, which we love but you can change the length to suit you. Available in european bust sizes 36-46. You can also choose 3 different pocket patterns to create different looks and the add-on pocket pattern can be downloaded for free - click here. The Pippi Pinafore is ideal for wearing at the weekend. Darts and gently curved sides shape the bib to create a flattering silhouette for multiple bust sizes. The pleated front skirt and side button placket create a relaxed look while also stepping your sewing repertoire up a few notches. Straps cross over the back and fasten to the bib using your choice of hardware or buttons. Deep curved patch pockets make sure you have room for everything you might need throughout the day. Pinafore dresses can lack a bit of feminine shaping but with cup sizes A to D included, you'll no longer need to make additional bust adjustment for the perfect fit. The Ariana dress pattern features a gorgeous button through sundress with a fitted bodice. The shaped bust seams and shirred back allows this dress to fit perfectly and be comfortable to wear in the sun. The skirt has gathers falling from the waist and two large patch pockets. You can make this sewing pattern into a midriff top too! At last a jeans sewing pattern with every style of jean imaginable! Ash is the ultimate stretch jeans sewing pattern, and includes four cuts and multiple lengths for tall, regular and cropped. The pattern features a comfortable rise, close fit through the waist and hips as well as the classic jeans details. The pattern contains 13 sizes and a unique jeans sizing system much like ready to wear jeans, which allows the sewer to achieve the best fit possible. The Kate Vintage Tea Dress combo has been designed for the slightly more advanced beginner. Evoking the vintage vibe this sewing pattern offers a great choice of styles, and is flattering for all figure types. Make with its 3/4 circle or box gathered skirt and choose from the two skirt lenght option. If you're not a fan of dresses then Designer Stitch has included a waist box top and separate 3/4 circle or box gathered skirt. This pattern also offers cups sizes for fine-tuning the fit of your garment including cup sizes B, C, D, DD. UK sizes include 6 -26 (2-22 US) and (34-54 EU). The jacket sits on the waist and has a ribbed waistband and cuffs. Sew with a large tapered collar or a ribbed college jacket style collar, and fasten with buttons. You choose which ones – normal buttons, jeans buttons or snaps. There's also a detailed Video Sewing Tutorial On YouTube to help you succeed. Make a more sophisticated version of the dungarees with a well-proportioned bib and optional utility pocket, or make without the bib entirely for a pair of wide-legged cropped pants, full-length pants or shorts. V-neckline jumpsuit, dress and top includes dolman sleeves, elasticated waistband and perfect for light to medium-weight woven fabrics such as challis, linen, chambray, cotton sateen, denim, cotton shirting. Inspired by vintage workwear, Jenny is a modern take on the classic overalls and wide leg trousers. The pattern features an ultra-high rise, sleek, functional details and a comfortable all-day-long fit. Make this sewing pattern your own by mixing and matching the curved slash front pockets, faux fly front, single or double zipper waistband and rounded back patch pockets. To personalise even further, sew some high contrast topstitching! The Pippi Pinafore from Jennifer Lauren Handmade is perfect for wearing at the weekend. Darts and gently curved sides shape the bib to create a flattering silhouette for multiple bust sizes. The pleated front skirt and side button placket create a relaxed look while also stepping your sewing repertoire up a few notches. Straps cross over the back and fasten to the bib using your choice of hardware or buttons. Deep curved patch pockets make sure you have room for everything you might need throughout the day. Jennifer has thought of everything, pinafore dresses can lack a bit of feminine shaping but with cup sizes A to D included, you'll no longer need to make additional bust adjustment for the perfect fit. Also included in the instructions is a full set of Finished Garment Measurements, as well as detailed instructions on choosing the right size for your shape. goer or love the boho look! The Bonnaroo Tank is a loose, basic style, which has a flattering silhouette. It's perfect for the warmer seasons, quick to sew with stunning results, and features adorable shoulder ties. Suggested fabric is a two-way lightweight jersey for rayon spandex knit for better drape but any knit fabric, including cotton lycra or sweater knit, with at least 50% stretch will work just as well. The Bonnaroo Skirt set includes a hi-lo version with or without ruffles, a gored version and two interchangeable waistband options. Choose a simple yoga band or a corset-style waistband. Suggested fabric for this skirt pattern is woven fabrics that have a flowy drape such as rayon, gauze or georgette, and for the woven waistband, a heavy woven such as duck cloth, brocade or heavy denim is recommended. Knit fabric with at least 50% stretch and good recovery is recommended for the yoga waistband. These PDF patterns come in sizes for tween sizes 12 an 14, and women's sizes 0-26.